Air-powered swirl-free sanding in the palm of your hand! The 3M Random Orbital 6 Inch Air Sander optimizes finish sanding and surface preparation during refinishing projects with a unique orbital pattern. The 3M Random Orbital 6 Inch Air Sander leaves a swirl-free finish while minimizing hand fatigue with a user-friendly design. Use the 3M Random Orbital 6 Inch Air Sander with your 6 inch 3M sanding and finishing discs. The 3M Random Orbital 6 Inch Air Sander is designed to leave a smooth finish without over-sanding any particular spot. The abrasive disc and disc pad on this dual action sander move in two distinct oval patterns. No single abrasive particle follows the same path twice. Therefore, the results are smooth and even across the entire sanded area, whether it's a small spot or an entire panel. The 3M Random Orbital 6 Inch Air Sander is driven by an air compressor (sold separately). This is a non-vacuum model, which is ideal for sanding and paint prep work where dust is not a problem. The 6 inch disc pad is ideal for sanding large body panels or entire vehicles efficiently and with uniform results. The 3M Random Orbital 6 Inch Air Sander is commonly called a dual action palm sander. That's because of the comfortable rounded shape of the sander's grip. Simply rest your palm on the sander and guide it over the vehicle. This design minimizes hand fatigue so you can work longer and achieve consistent results. At just under 2 lbs, the 3M Random Orbital 6 Inch Air Sander is easy to handle. The 3M Random Orbital Air Sander has a rounded grip and compact size for easy handling. All 3M palm sanders are precision balanced, taking into account the weight of the abrasive. The result is smooth sanding when the abrasive is attached. Inside the 3M Random Orbital 6 Inch Air Sander, a polymer rotor provides fast acceleration, reduces tool weight and internal friction, and simplifies tool maintenance. A one-piece pad balancer and motor shaft is made from heat-treated steel to provide smooth, dependable operation. The 3M Random Orbital 6 Inch Air Sander has a 3/16 inch orbit, which is rated for general purpose sanding. A Stikit™ Low Profile Disc Pad is included with the sander. 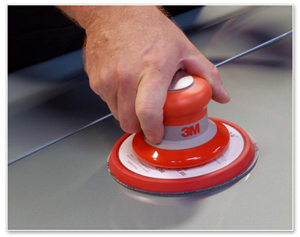 Check out our selection of 3M sanding and finishing discs for more disc options. When dependability, performance, and swirl-free results are important to you, use the 3M Random Orbital 6 Inch Air Sander for all your repainting and reconditioning projects.